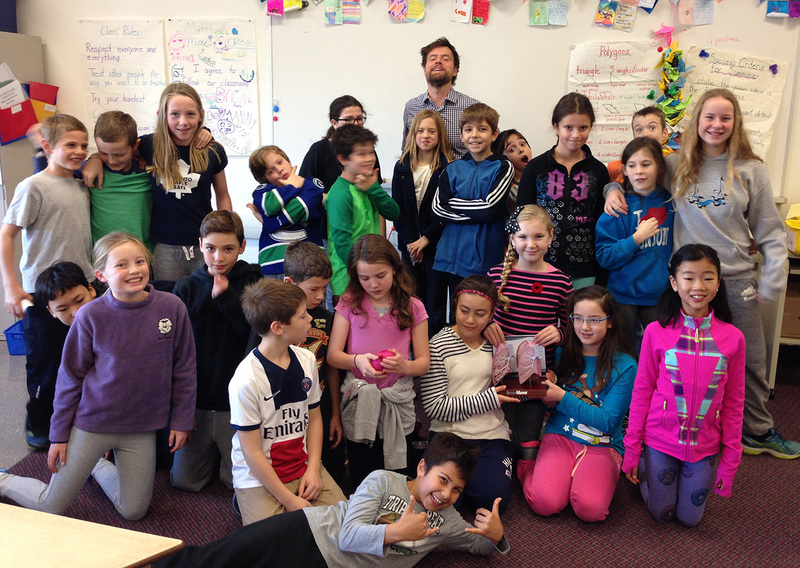 Last week I had the pleasure of speaking to a class of wonderful grade 5’s about medical science visualization. They’re learning about the human body and invited me talk about the amazing things we get to do at AXS studio, with a short lesson on the respiratory system thrown in. It was super fun. Kids are so awesome: so curious and funny and keen to learn. We started with ‘what we’re all made of’, tracing our composition from organs to tissues to cells, molecules and atoms. We talked about how medicine is increasingly happening at the molecular level and that’s the realm where many medical artists now work. I showed animations that move from organs, through cells to molecules and demonstrate how they interact with one another to ‘make us work’. We then discussed how similar we humans are to many other animals — we have many of the same parts and many species start out much the same at the embryonic stage. To demonstrate, I showed our Chick embryo: 10 years to hatching animation which got a spontaneous round of applause! 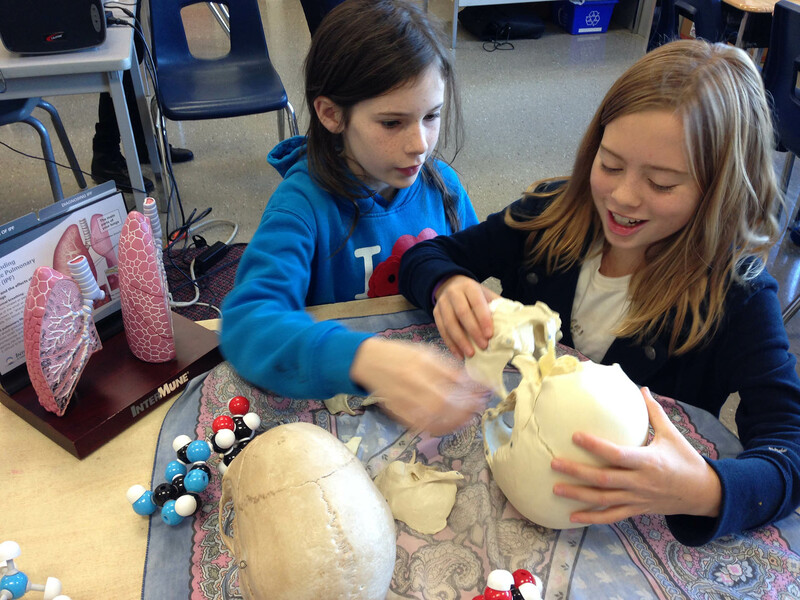 A highlight for the kids was the models I brought in: casts of a dolphin and human brain (thanks Professor Lumsden! ), human skulls, molecular (CPK) models of common substances, and 3 sets of lung models, courtesy of Joel Bathe from InterMune. We ended with a quiz — to see who was really paying attention. The correct answers were ‘lymph node’, ‘alveolus’ and ‘capillary’ (see if you can guess the questions). I got some hilarious responses, but ultimately the right ones and 3 clever kids went home with AXS calendars. Thanks to Ms Netley, Ms. Balane and the grade 5s at Maurice Cody Public School. Make it interactive. Don’t simply talk to them, but make it a dialogue with lots of Q & A. Use models. many kids are hands-on learners; they like to touch and feel the subject. Use pictures and video — lot’s of them. A soon as I start to lose kids while talking, I switch to a new image and, bing, they refocus. Relate the subject to everyday experience, so it’s meaningful. When discussing the importance of respiration and gas exchange in the alveoli of the lungs, I relate it to the discomfort of holding your breath, or being winded after a run. If you’re talking about anatomy, ask if anyone gets queasy, then give them a heads-up before showing pictures of anatomy. I take for granted that the inside of a body is fascinating. Not so for everyone. Make it fun! Science is about curiosity and discovery. Awesome! Love that you visited Zoe’s class. I’ve just discovered this blog. Great tips for presenting to kiddos too. I still remember having to be excused from class in Gr 7 cause a guest speaker was talking about blood and I was going to faint….much tougher now!